Transit Link JB (or better known as City Bus) is part of the Transit Link group of companies, and is one of the more renowned bus operators in Johor Bahru (JB). The orange livery buses operated by Transit Link JB are one of the oldest but reliable buses in its fleet. Newer buses were acquired in the recent years. Transit Link JB buses are operated on the more popular bus routes across Johor Bahru and also runs one of the longest bus service from Larkin to Ayer Hitam. Intercity express bus services are also offered by Transit Link JB, with the buses branded as Johor Super. Transit Link used to operate the stage bus business in Penang (known as Transit Link PW). However, with the establishment of Rapid Penang in July 2007, along with many other Penang bus operators, Transit Link PW folded up its operations in Penang. Some buses from Transit Link PW were then transferred to operate as the JB stage bus fleet. Other than Transit Link PW, Transit Link group of companies also consist of Johore Motor and South Johore Express. 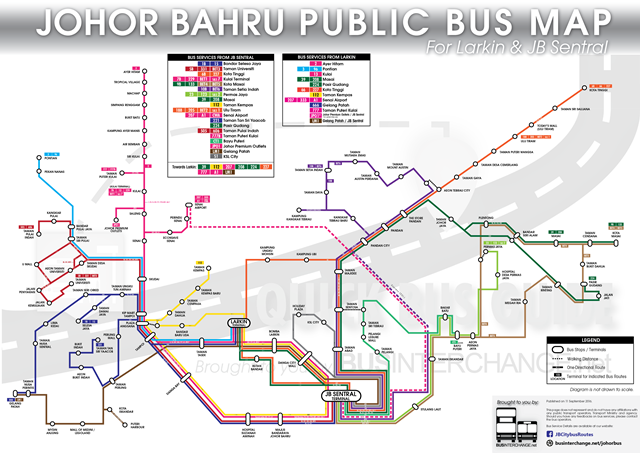 Johore Motor operates a single stage bus route in the Johor state, from Kluang to Batu Pahat. The fleet of stage buses are notably similar with Transit Link JB buses. South Johore Express operates intercity express bus routes, which runs from Larkin to Kluang and Segamat. However, their express buses are often seen with the Johor Super livery, together with express buses registered under Transit Link JB.